One of my clients reached out to me today to discuss a potential safety issue with one of the network-enabled devices they use for patient care. Although there hasn’t been an official recall by the manufacturer, there have been enough concerns for my client to want to remove the devices from use while they perform an evaluation. The new devices had only been in service for a couple of months. Luckily they still have the previous devices in storage and can redeploy them for patient care. They were looking for guidance on how to communicate the issue without alarming physicians who had come to rely on the data points from the machines. They haven’t had to do anything like this before and didn’t have a policy or procedure in place. I recommended that they use the procedure they follow for pharmaceutical recalls as a potential template. It hadn’t occurred to them to think about it that way – I think they were mostly still getting over the idea that they had to deal with a situation with a number of unknowns. I was able to talk them through a step-wise plan for addressing it, and by the end of the call, I could tell their stress level was substantially lower. It reminded me of some of the disasters I encountered during my first couple of years in the CMIO trenches, when it felt like every day brought a giant pile of unknowns that I had to deal with. It was a good reminder of the ways in which being a consultant can be rewarding as well as the fact that the role of CMIO is a relatively new one and there are plenty of us still learning as we go. Many of us are homegrown clinical informatics professionals who got into it either because we enjoyed technology or we were “voluntold” by our employers that we would be wearing a new hat. I like to think that makes us very skilled at thinking on our feet and being creative with problem solving. Still, I sometimes envy people who completed formal informatics studies and had easy access to mentors at critical points in their careers. One of my former colleagues who accepted an informatics role much in the same way that I did (come on, it’s only four hours a week!) is planning to take the Clinical Informatics board exam this year before the “grandfather” period expires. When you’re already in the trenches, the idea of trying to find the time and money to enroll in a formal program can be daunting. On January 26, the US Preventive Services Task Force issued a final recommendation that all adult patients be screened for depression. Changes in recommendations usually lead to a flurry of IT activity as preventive services tracking and reminder software requires updating to accommodate the changes. The most nimble vendors will have the new guidelines embedded within a few weeks, but others may take significantly longer. The HIMSS16 invitation cycle is finally upon us. I always get a kick out of the different event invitations. Some of the best parties I’ve been to are at HIMSS and putting together the social schedule is always a bit of a challenge. I’m hoping the Monday start will shake things up a little and allow me to attend parties I’ve previously missed due to conflicts. If you have an event (whether after hours or on the show floor) and you’re interested in coverage from the HIStalk team, let me know. We try to make as many events as possible as long as schedules (and our tired feet) allow. 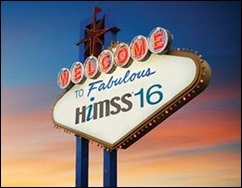 ONC shared a list of its activities at HIMSS. The Tuesday session with Karen DeSalvo and Andy Slavitt might be a “must see,” especially if Mr. Slavitt goes off script again and starts lauding the demise of federal programs. If nothing else, the session should be Tweet-worthy. I’ll also be keeping my out for my favorite former ONC staffers, including Jacob Reider and of course Farzad Mostashari. 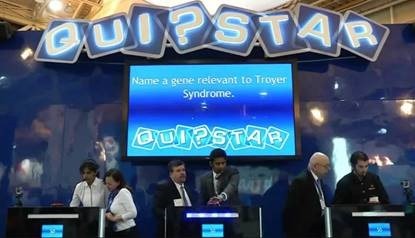 I heard a rumor that Medicomp Systems has something new in store for its Quipstar game show booth. I always enjoy seeing the game and catching up with the team, as well as taking advantage of their seating when I’m running out of energy. I had the opportunity to hang out with CEO Dave Lareau at HIStalkapalooza last year – I wonder if he’s eager to pinch hit for pie-throwing duties again? A reader shared this piece on physician burnout. My initial read of the data focused on the specialty distribution, but that approach masks a larger problem. Burnout rates increased across all specialties from 2011 to 2014. Even more significant, only one specialty reported a burnout rate of less than 40 percent. The comments section is worth a read for those looking to understand why physicians are angry, stressed, and looking to do something else. What are your strategies for dealing with burned-out physicians? Email me.